A simple and easy way to enjoy fresh fish, this delicate Trout with Mushrooms recipe features delicate mushrooms, battered trout, and creamy lemon sauce in and elegant and easy dinner any time. The lightly breaded trout and heavy cream sauce make this recipe as delicious as it is easy to prepare! In small shallow dish combine flour and salt; coat fillets with flour on each side, and set aside. Add 2 Tbsp of butter to skillet and melt. 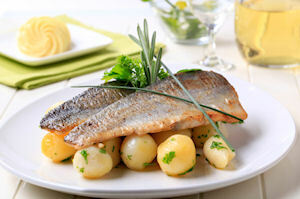 Cook trout over medium heat for 8 to 10 minutes on each side or until fish flakes easily work a fork. Set aside. Melt remaining butter in small saucepan. Whisk in cream and lemon juice, stirring constantly. Bring to a boil for 3-4 minutes until slightly thickened, stirring constantly.